Spent a quiet afternoon exploring the forest around the base of Mt Cordeaux on the track out to Gap Creek fall. I was walking with no particular destination in mind but looking for photo opportunities. 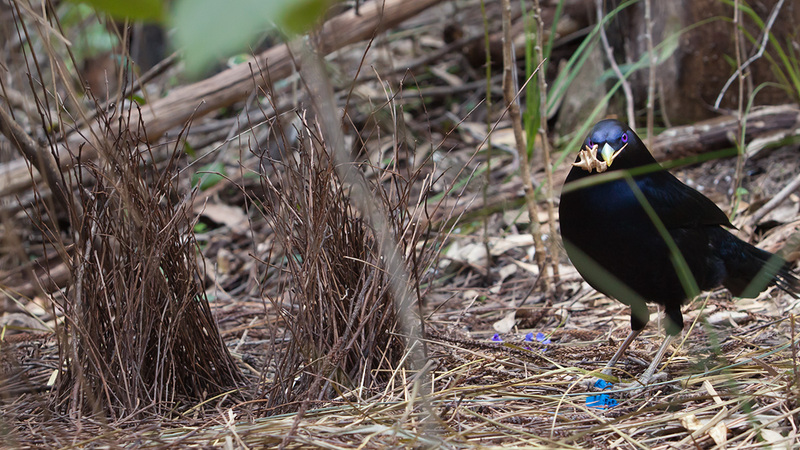 At once stage I saw this bowerbird and after a bit of hunting around I found his bower. The sun was getting low in the sky and soon to dissappear behind Mt Cordeaux. I set up my tripod and settled in to wait… I could see him hanging around and he darted in an out a few times over about and hour but not long enough to get a decent shot. Eventually just as it was getting too get a decent photo he hopped into the bower and I managed to catch this shot.